Pittsburgh is the seat of Allegheny County and is the second largest city in the Commonwealth of Pennsylvania. It is known as both the "Steel City" for its more than 3000 related businesses and the "City of Bridges" for its world record of 446 bridges. Legendary for its steel, Pittsburgh also led innovations and industries in aluminum, glass, shipbuilding, petroleum, foods, appliances, sports, transport, computing, retail, autos and electronics. Sit back and relax as we head to western Pennsylvania for a weekend getaway. Upon arrival in Pittsburgh we will meet our guide to set sail on the Explorer Riverboat for Rivers of Steel's 90-minute "Pittsburgh 101: An Intro to Innovation" sightseeing cruise on all three of Pittsburgh's rivers. After our cruise we will check-in to the hotel for our two-night stay. Dinner this evening will be at The Grand Concourse, the former Pittsburgh and Lake Erie Railroad Station by the Monongahela River. 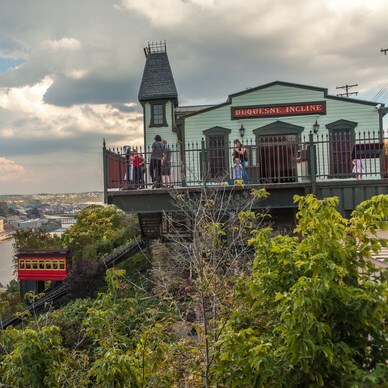 Following dinner, we will enjoy a ride on the Duquesne Incline, a century-old funicular; one of the few left in the nation! After breakfast, we will depart for the Bost Building, former headquarters of the Amalgamated Association of Iron and Steel Workers, which is now the visitor center and heritage museum for Rivers of Steel National Heritage Area. We will then depart with our step-on guide to the Carrie Blast Furnace Complex where we will get the chance to explore Pittsburgh's steel heritage on-site. We will then travel to the Historic Pump House where the 1892 Battle of Homestead occurred, one of the biggest events in U.S. Labor History. Lunch will be included before heading to The Frick Art & Historical Center. Here we will experience the culture and refinement of the Gilded Age of steel heritage amidst the beautifully landscaped gardens, art gallery and antique car museum. Next, we will have a sightseeing tour of the Nationality Rooms at University of Pittsburgh's famous Cathedral of Learning. The classrooms represent the ethnic traditions of the people that settled in the Pittsburgh area throughout the years. Afterwards, we will return to the hotel where you can enjoy dinner on your own in one of Station Square's restaurants. Today, following breakfast, we will have a city tour which will include downtown, historic North Shore, sports stadiums and the "Three Sisters Bridges". Then, we will stop at Heinz Chapel for a docent-led tour and organ recital. The final stop before leaving Pittsburgh will be the Phipps Conservatory. The Conservatory was a gift to Pittsburgh by steel magnate Henry Phipps. You will be able to have lunch at the Café Phipps before departing for home. Arrival back in Pennsburg will be later this evening.